BSNL launched Broadband on Bharat Fiber to counter Jio GigaFiber. The company started taking registrations for the service through its Online self-care portal. Bharat Fiber will offer high-speed data and Wi-Fi connectivity to subscribers across India. BSNL targets telecom Jio GigaFiber and Airtel V-Fiber with the launch of Bharat Fiber. BSNL says its fiber connectivity provides a fixed access platform to offer high-speed broadband from 256 Kbps to 100 Mbps. Much has changed and many more should change in the country's broadband market in the coming months. The news of the commercial launch of the GigaFiber Jio service, which took place in March 2019, has led to rival companies to develop better projects and offers. While old players like Airtel and ACT Fibernet that offer fiber to the home (FTTH) have already improved their game by changing existing plans or expanding the operational area, the state-owned Bharat Sanchar Nigam, also known as BSNL has also joined the tender high-speed broadband now launching Bharat Fiber. Bharat Fiber will offer high-speed data and Wi-Fi connectivity to subscribers. Speaking at the launch of the new broadband service, Vivek banzal, director of the BSNL CFA, said: "We realize that customers today demand super-fast internet and have begun to have more electronic smart devices and entertainment media tools than ever. "Home technology has been updated and we are pleased to announce the launch of Bharat fiber, which will be affordable, but able to meet the great demand for customer data." BSNL planned to counter Jio GigaFiber and Airtel V-Fiber with the launch of Bharat Fiber. Online registrations for the Bharat fiber have already been started on the Selfcare BSNL portal. It is said that the service offers data of 35GB internet usage per day at a price lower than 1.1 rupees per GB. The company says its fiber connectivity provides a fixed access platform to offer high-speed broadband from 256 Kbps to 100 Mbps. What is BSNL Broadband on Bharat Fiber? Before understanding the Broadband on Bharat fiber, it is important to understand what the FTTH service is. Fiber to the home or FTTH is the technology to bring high-speed Internet services using fiber optics directly from home operator switching equipment. BSNL Bharat Fiber will offer a high-speed Internet service at home using optical fibers that replace the existing cable infrastructure. The company will extend the fiber from the location of the nearest central office (CO), directly or through the franchisee and install HONT and battery backup locations identified by the customer. Services such as voice, broadband, IPTV, etc. will be enabled based on the plan selected by the customer. How to get BSNL Bharat Fiber Connection? 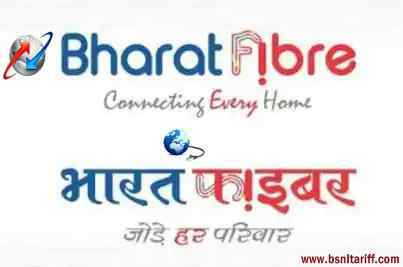 BSNL has started online registrations for Bharat Fiber through its Online Official portal. User need to visit BSNL website portal and click on the fiber broadband option on the left side of the page as the sixth option. Click on the broadband tariff and you will see the "Register Online" option at the top right next to the download form option. Touch it and follow the instructions. We tried to register. For now, Bharat fiber is only available in selected cities. The list shows that the service is available in 11 cities in Andhra Pradesh, a city of Bihar, three cities in Chhattisgarh, eight cities in Gujarat, four cities in Haryana, two cities in Jharkhand, ten cities in Karnataka, six cities in Kerala , six cities of Madhya Pradesh, Maharashtra 11 cities, a city in Odisha, Pondicherry, five cities in Punjab, Calcutta, two cities of Uttarakhand, UP nine cities, five cities in Tamil Nadu and ten cities of Rajasthan. What does the Bharat Fiber configuration include? BSNL technical persons will setup a home optical network named Home Optical Network Termination (HONT) modem with four Ethernet ports of each 100 Mbps and two standard telephone ports at home. Each port will provide 100 Mbps broadband, IPTV, video IP calls and lease, as requested by customer lines. The company also provides a power supply with a full four-hour backup and a normal three-day backup along with HONT. What are the Internet services that can be enjoyed through the Bharat fiber? Internet services through Bharat fiber, as indicated on the bsnl's website are: IP TV service (MPEG2), Video on Demand (VoD) (MPEG4) and VCR, audio on demand, bandwidth on demand (user and / or configurable service), online distance education, point-to-point and point-to-multipoint videoconferencing, virtual classroom, voice telephony and video over IP: connection under control of switches centrally located software, interactive games, telephony services to broadband, dial-up Virtual Private Network and virtual private LAN service (VPLS). Charges for activation or installation for Bharat Fiber? No, BSNL not charging any type of charges for the activation or the charge for the installation. However, Rs 500 must be paid as a security deposit only once for the optical network terminal (ONT) which is returned when the ONT returns in working condition. ONT charges If hired for rent is Rs 90 per month and Rs 1,080 per year. This is if you take the ONT instrument. ONT with the cost of ADSL Wi-Fi modem will cost 200 rupees per month and a security deposit of Rs 1500. Any DSL broadband plan, with a value of Rs 375 and above is applied in Bharat fiber (FTTH). What are the Bharat Fiber monthly retnal plans? Plans start at Rs 777 to Rs 16999 per month. 18GB plan costs Rs 777 per month, 25 GB plan at Rs 1,277 per month, plan for Rs 2499 40GB, 50GB plan at Rs 3999, Rs 5999 80GB, 120GB and 170GB at Rs 9999 at Rs 16999. The above Broadband over Bharat Fiber plans will be available in all telecom circles except Andaman and Nicobar.